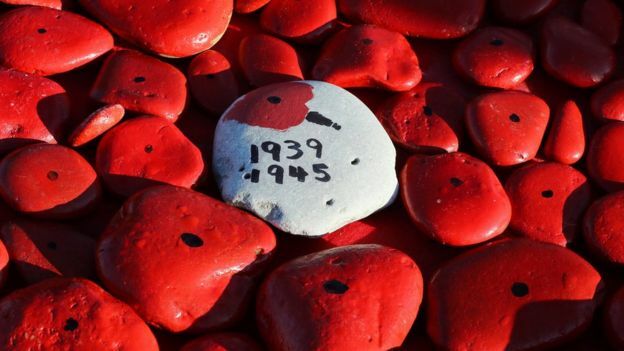 Silence fell at 11:00 GMT to remember servicemen and women killed in battle. England and Scotland footballers are expected to risk breaking Fifa rules forbidding «political statements» when they wear poppy armbands at their World Cup qualifying match at Wembley later. People gathered at war memorials and in schools, offices and other public places across the UK to pause for two minutes to commemorate the moment the guns fell silent for peace at the end of World War One, on 11 November 1918. Hundreds of people attended the Royal British Legion’s Silence in the Square event in Trafalgar Square, where poppies were laid in the fountains and music was performed by a range of artists including Russell Watson. A service of remembrance was also held at the Cenotaph, where singer Cerys Matthews read the poem In Memoriam by Ewart Alan Mackintosh. The sun shone and as 11 o’clock approached, Trafalgar Square filled with people of all ages. 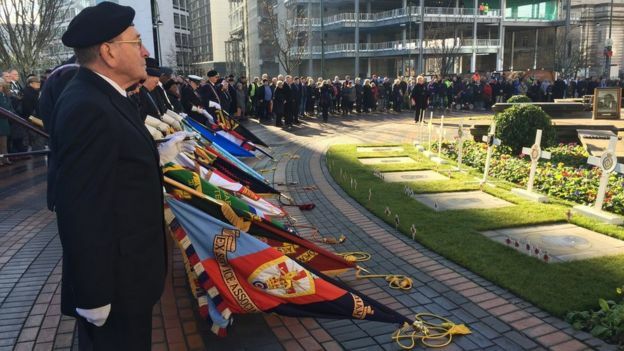 They listened to moving poems and songs and as the The Last Post began at one minute to 11:00 GMT, all traffic was stopped and one of London’s busiest squares fell silent. 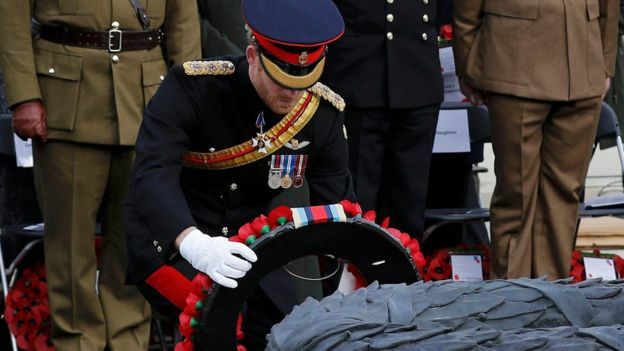 The Royal British Legion which organised this event has called for a «rethinking» of Remembrance, asking people to think not just of those who died in the two world wars but more recent conflicts as well. 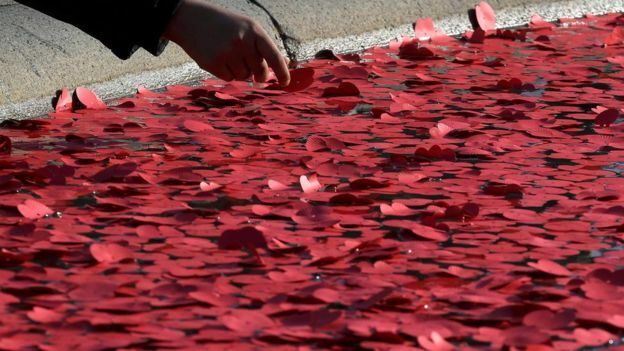 After a bugler signalled the end of the two minutes’ silence, the traffic restarted and hundreds of poppy petals were scattered into Trafalgar Square’s fountains representing those who sacrificed themselves for others in conflict. 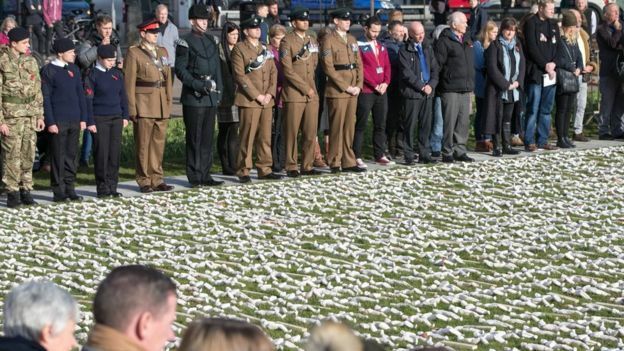 In Bristol, 19,240 shrouded figures were laid out on College Green, each one representing a soldier who was killed on the first day of the Battle of the Somme. Prince Harry read Rupert Brooke’s poem The Soldier, written at the beginning of the war, as part of the service at the National Memorial Arboretum. How do we remember World War One? The Prince of Wales has attended a service in Bahrain, where he laid a wreath and met senior military representatives and UK veterans working in the Middle East. The Royal British Legion charity has organised dozens of events for Friday following weeks of fundraising by selling poppies. 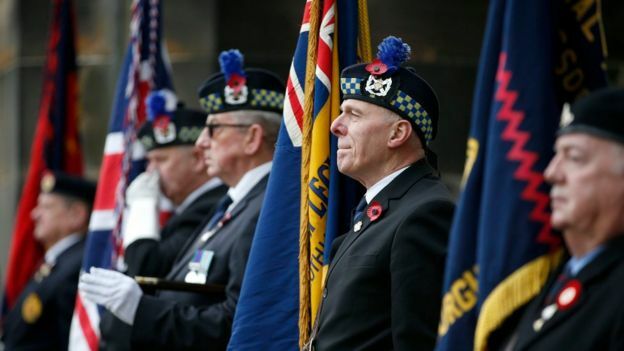 Armistice Day is followed by Remembrance Sunday on 13 November, when royals and senior politicians pay their respects at the Cenotaph memorial in London. Meanwhile, the Football Associations of England and Scotland have said they will let players wear black armbands with poppy emblems despite a warning from Fifa, football’s governing body, that doing so could breach rules banning «political, religious or commercial» messages. However, Fifa has since issued a statement saying it has not banned England and Scotland players from wearing armbands featuring the poppy as has been reported, because it cannot pre-judge what symbols would constitute such a breach. Both FAs have said they are willing to face any punishment – though they insist it will not come to that. 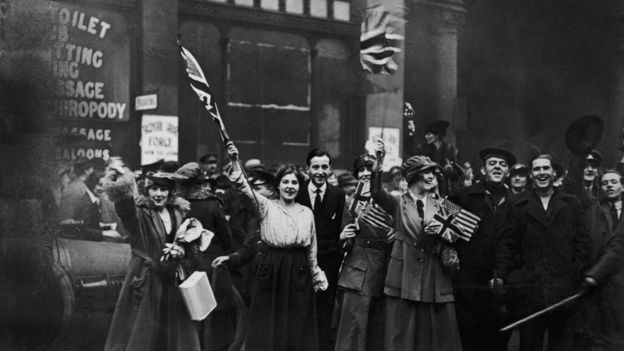 Armistice Day falls each year on 11 November to mark the day in 1918 when the fighting in World War One was stopped. The Allies and Germany signed an armistice in a railway carriage in the Forest of Compiegne in France at 05:00. Six hours later, at 11:00, the conflict ceased. King George V announced that a two-minute silence would be observed in 1919, four days before the first anniversary of Armistice Day. The silence continues to be observed every year on the 11th hour of the 11th day of the 11th month.